Anger messages: Learn how to control anger by reading inspirational messages about being angry. These quotes explain how anger always leads to hurt and pain. Send these as text messages or use them as funny yet enlightening Facebook status updates to make everyone realize the importance of controlling anger. You can make a big difference to the lives of your friends, loved ones, family, colleagues, boss and co-workers by sharing some of these wise words. Share this page with others or forward it by email to someone who has a reputation of losing his or her temper – your contribution in helping people deal with anger can literally change someone’s sad life. 1) Anger is like a flame on a candle. 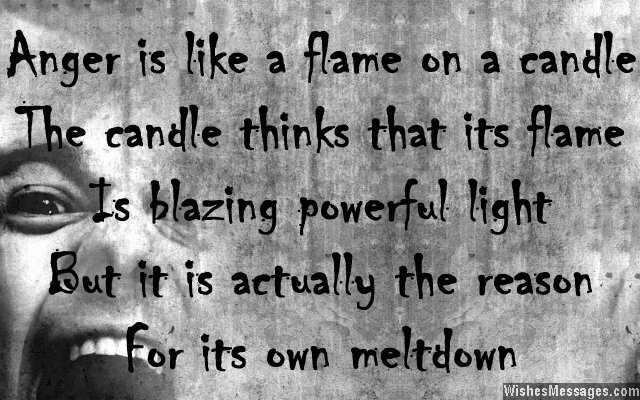 The candle thinks that its flame is blazing powerful light, but it is actually the reason for its own meltdown. 2) Sometimes the cost of an impulsive and angry reaction can be so large that you wouldn’t able to buy your words or actions back even if you were a billionaire. 3) When you can’t take charge and control your anger, your anger will inevitably take control of you. Lesson to learn – control your anger before it controls you. 4) You can channel your anger positively to gain high focus and concentration. You can also channel your anger negatively to create damage and destruction. Whichever way you do, always remember that it is your own doing – don’t blame anything on anger. 5) ANGER actually means Atrocity, Negativity, Greif, Exhaustion and Regret. Convert that ANGER into Assertiveness, Niceness, Goodness, Eagerness and Righteousness. 6) Nursing a rage and a fire in the belly to change the world to make it a better place to live is the best and only type of anger you should have. 7) If kicking the wall helps you extinguish your anger, do it. It is easier to repair a broken wall than to mend a broken relationship. 8) Just because you have money in your bank, you shouldn’t spend it all the time. Just because you have an emotion called anger in your heart, you shouldn’t use it all the time. 9) You become angry when you lose your temper. You lose your senses when you lose your temper. You do crazy things when you are not in your senses. You make mistakes when you do crazy things. You regret when you make mistakes. Why do you want to be angry, only to regret later? 10) Anger is one of the greatest tests of friendship. If your friend can tolerate your anger, you must be willing to tolerate anything for your friend. 11) Watch what you say when you are angry because it is like being drunk. The truth might slip off your tongue ruthlessly and you will never be able to undo it. 12) Anger may make you a dramatic person, but forgiveness will make you a heroic person. So stop being dramatic and start being heroic today. 13) Anger will cloud your eyes so badly that you will forget how to differentiate between a friend and foe. So be angry at your own cost. 14) Getting angry at yourself for not being able to accomplish something will catapult you to success. Getting angry at others and blaming them for not being able to accomplish something will definitely lead you to failure. 15) Anger exposes your insecurity where as forgiveness exposes your generosity. 16) Channeling your anger will help you to focus yourself and break down barriers between people and opportunities. Not channeling your anger will make you break down relationships and your character. 17) When you are calm, you can either win or lose in the game of life. But when you are angry, you have no choice but to lose. 18) Excess salt may or may not give you blood pressure but an angry mind, bitter heart and revengeful soul definitely will. 19) Some of the greatest artistic works of our time have been created out of a fit of rage and rebellion that the creators had in them to change the world for the better. The lesson to learn is that anger is beneficial only if it is used in the right way and good intent. 20) Throw a temper tantrum, throw a fit of rage, throw piercing looks, but don’t throw away precious relationships with anger. 21) Anger can sometimes bring out the best in you and make you shine. But most of the times anger brings out the worst in you and makes everyone around you whine. Don’t get angry. 22) Every time you get angry at someone else’s mistake, you give up bits of your own happiness. It is the stupidest sacrifice you can ever make. 23) When you are brimming with anger, it does not mean you are full of life. It means you don’t know how to live a happy life. 24) When you are wrong, you are likely to use your anger and fight with all your might. But you will never be angry and you will always remain calm, when you know that you are right. 25) Whenever you are angry at someone – scribble furiously in your diary, hit the gym, count one to hundred, mediate or shout to the wall. Do anything you want to but don’t come face to face with the person who has made you angry. 26) Let anger bring about a revolution that can change your world, not destruction that devastates your world. 27) Don’t let anyone else control you by leaving the remote control of your life in someone else’s hands by becoming angry at them. 28) Don’t get mad at other people to the extent that other people think you are mad. 29) Don’t be under the impression that the louder you utter words in anger, the stronger you become. Anger exposes your fragility and shows your opponent that you are weak. 30) The person who can enrage you in a jiffy, is the person you should be the most scared of. 31) The ability to be calm in volatile situations is one of the key personality traits of all successful people. But to be calm, you need to control your anger first. 32) When you are calm, you have nothing to lose. When you are angry, you have everything to lose. So always prefer being calm over being angry. 33) Getting angry is like fighting a war. No matter who wins, there are always going to be casualties and bitter consequences to deal with later on. Don’t get angry, avoid the war. 34) Regret may be the reason why you become angry. But if you don’t control your anger, you will regret even more. To stop regretting, you must stop being angry first. 34) Don’t be mistaken that becoming angry will end all your fights, quarrels, arguments, disagreements and clashes. Anger will be to all those, what fuel is to fire.